For decades, the CIA's top secret postmortem on the April 1961 Bay of Pigs invasion has been the holy grail of historians, students, and survivors of the failed invasion of Cuba. But the scathing internal report on the worst foreign policy debacle of the Kennedy administration, written by the ClA's then-inspector General Lyman Kirkpatrick, has remained tightly guarded -- until now. Dislodged from the government through the Freedom of information Act, here is an uncompromising look at high officials' arrogance, ignorance and incompetence, as displayed in their attitude toward Castro's revolution and toward the Cuban exiles the CIA had organized to invade the island. 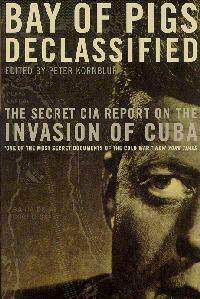 Including the complete report and a wealth of supplementary materials, Bay of Pigs Declassified provides a fascinating picture of the operation and of the secret world of the espionage establishment, with stories of plots, counterplots, and intra-agency power struggles worthy of a Le Carré novel. "A picture of an agency shot through with deadly self-deception...An untapped well of cold, hard facts." Return to National Security Archive Documents Readers.